When experienced standup paddlers describe the downwind run you are about to do the very next day and they say, “It’s going to be harrowing, huge swells and very little wind,” that does not build confidence! Like most of the participants, I spent a great deal of time paddling on my knees, really getting a challenging balance workout while going for the glides or taking some head-first dunks into the confused sea. When I had feet under me, eyes on the horizon and my paddle technique cranking out smoothly, holy cow, the Naish 14′ Glide I was riding accelerated with glee and practically begged to connect those glides. Exhilarating stuff for sure. Light as a feather, my KIALOA Hulu paddle powered me through chop and (YAY!) let me brace, balance and avoid plenty of wipeouts. 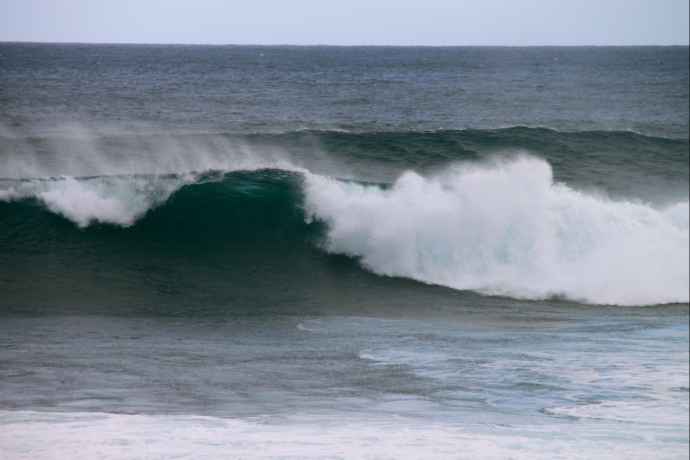 Defining moment, uncaught wave of the day. And that was a good thing! I braced my paddle in the water to my right, swung my eyes over and looked straight up into a building and breaking wall of gray-green and foaming wave. There was just one reaction, and it surprised the living daylight out of me – I was like, “Yeah!” and went for it. Went for it as in, “I want to catch this thing.” Lucky for me, very lucky, the water was deep enough that instead of crushing right onto me, it re-built as a pillowing swell and swept neatly under my Glide. Also lucky for me, I realized how much I love being in the ocean, riding waves, being part of a huge community of like-spirited paddlers and enjoying the fruits of much practice and training. It’s all a very cool journey. It’s tough to put into words the impact an event like one’s first Maliko Gulch downwind run delivers. Instread, here’s a 4 minute video that tells the tale. Much appreciation (listed in the credits at the end) go to Naish International (Haiku), KIALOA Paddles, GoPro, and Suzie Cooney, CPT. Each week I look forward to receiving links to GoPro VIDEO OF THE DAY. Astounding views, amazing athletes, adventures and non-stop-action abound! Always diverse and endlessly cool – naturally when my friends and I watch these we hope to create something of that caliber ourselves. We are passionate about standup paddling of every sort and we’re crazy about getting in and on the water at every opportunity. Full moon magic is an Elder SUP routine, how about you? Take the Water – Wherever You Are: Talking story around the fire on the beach, at a lakeside campsite or over a brew in a river town used to be the default way to re-live great SUP experiences. Armed with a GoPro easily strapped to a chest mount, a head mount, or a solid mount on our board we seamlessly collect images as we play our way through the day – or full moon night. There’s no end to the number of ways we can “take the water wherever we are” via cool video clips and movies – Dropbox, Vimeo, Picasa, YouTube, Facebook, blogs. The next question begs, “How many of your videos are so compelling that friends – and friends of friends – actually want to watch your story?” For me, as long as there is beautiful water, people grinning and having a good time and a play of light and sights – then I am into a video. Next caveat, attention span. We love a production called, Reflections, but at 8 minutes it’s asking for a lot from most of us. As a poetic approach to editing wonderful video footage, it’s inspiring. Where’s your inspiration-generating water? 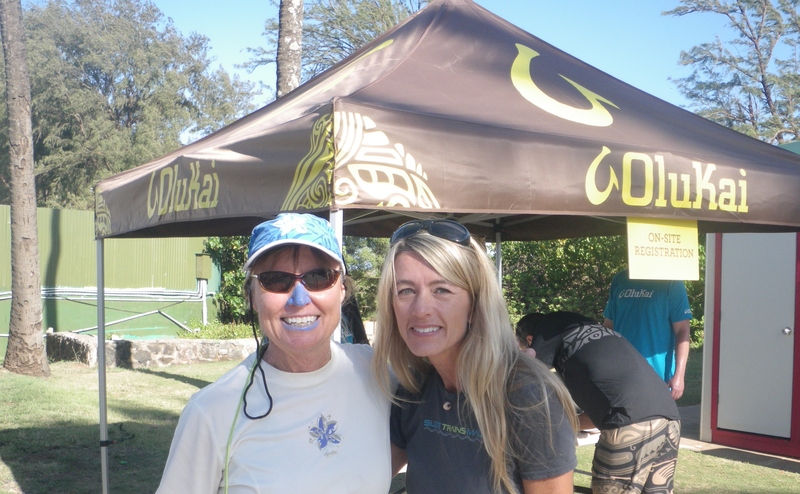 Here is Suzie Cooney of SuzieTrainsMaui.com getting her stoke on! So here’s our plan. During an upcoming vacation to Maui, rather than trying to get epic shots of us catching waves (not so much) or attempting to capture the energy and magic of the Olukai Ho’olaule’a while actually participating, we will simply capture what we capture. We’ll plan some shots that would set a mood or emotion. Later, all sun-burnt, salty and inspired, we’ll create the wordsmith story, maybe even a poem, that comes to mind. With that as a guide, we can watch our GoPro footage again and again. Grabbing scenes and images that can be woven into a story may be commonplace for many videographers. For us, it’s going to be new – an adventure of its own. For a terrific example of great word-smithing of images can be, check out Blue Sway by Paul McCartney, below. That moment after a too-steep take-off when the nose of your surfboard buries deep, that moment just before you rocket through the air tightly clutching your paddle – you know! You know that your feet were not in the ideal position to trim your board successfully – it’s obvious. Karen Wrenn posted this very cool photo – great color and an easy way to study foot position and technique. Knowing the force of winds in the gnarly Columbia Gorge area where Karen spends a great deal of training time, that is good to know. As the weather warms, our local SUP community plan many jaunts to the Hood River and Portland area for down wind fun. 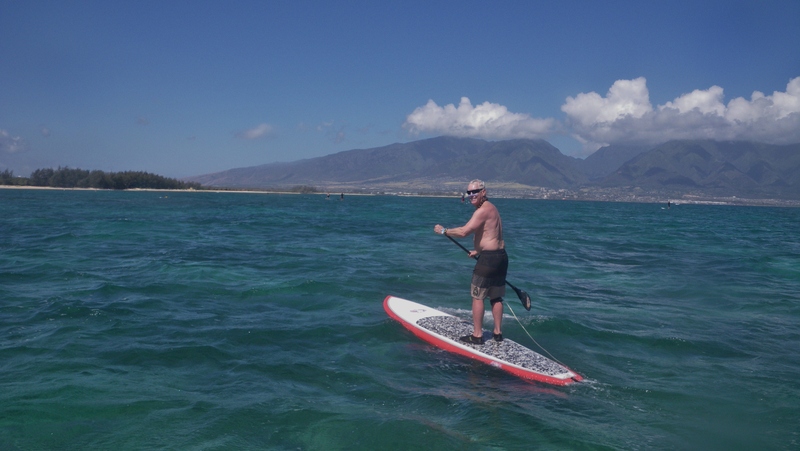 With just a few weeks before the most challenging down wind adventure of our lives at Maliko Gulch and the Olukai Ho’olaule’a, we have been barefooting it on the sleek 14′ Naish Glide as winter hiccups into spring. Balance as we maneuver is crucial – falling into the barely above freezing Deschutes River is not an option. There’s the rub! Tail turn practice goes tentative – and immediately balance becomes sketchy. It’s a great mental practice to feel the right movement to position and coordinate strong paddle strokes. Evening light adding to our bliss! Our puzzle remains – what’s the best foot position for the various aspects of conditions we’ll encounter on the Maliko down wind route? We will be sharing this post far and near, hoping for insights and input. While we will be participating in a “race,” our goal is safe completion of the journey. We know we have awesome equipment with our Naish 14′ Glides underfoot, so we hope to refine our skills so that we can make the best of the famed “glides” we’ll be earning along the way. How incredibly cool is it going to be to feel that first rush of wind after going beyond the cliff at Maliko Gulch! What a thrill it’s going to be to be surrounded by hundreds of other paddlers as the swells start rising on our quarter and from directly behind! Butterflies – yup! 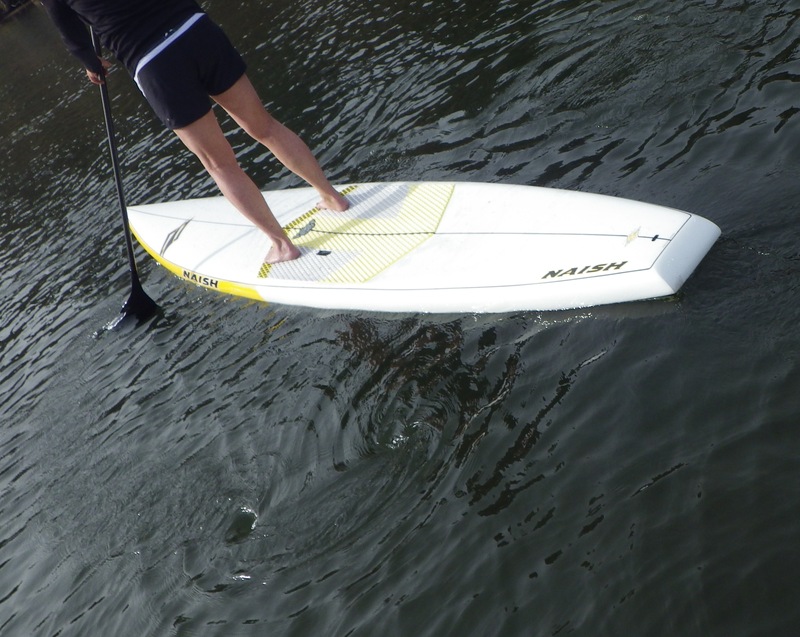 We can’t wait to practice in the warm ocean – to fall as often as needed into WARM water – and to peddle forwards and back along the foot-friendly deck of the Naish Glide. The best and right equipment for the adventure adds so much confidence and fun to the mix! Yeah, the stoke is fueled. 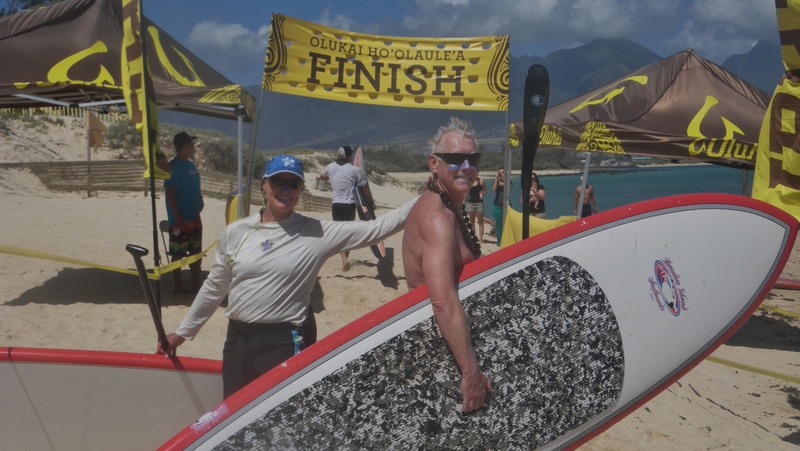 Please share your insights and comments on the blog or via e-mail eldersup@gmail.com – some comments we have received so far can be read at Aloha of the Paddle. This seems to be a good foot position for flat water up wind and down – comments? Suzie Trains Maui – and Eddie! 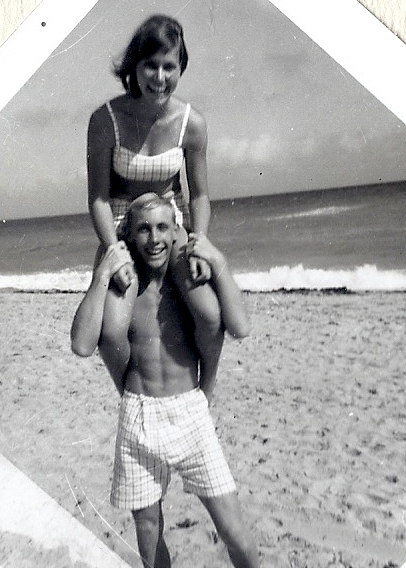 Back in the day – 1966-1970 to be exact – Ed and I were playing at surfing the mushy calf-high waves we had in balmy South Florida. We were the Beach Boys-era sweethearts. From 1970-2007 we didn’t surf, using our ocean time to sail, scuba, windsurf, fish, finish college and raise the family. 2001 found us moving life to Oregon, and by 2007 we discovered standup paddling and were back in the surf 4 decades later! In the natural progression of things, two diverse events influenced our Summer 2012 activities. 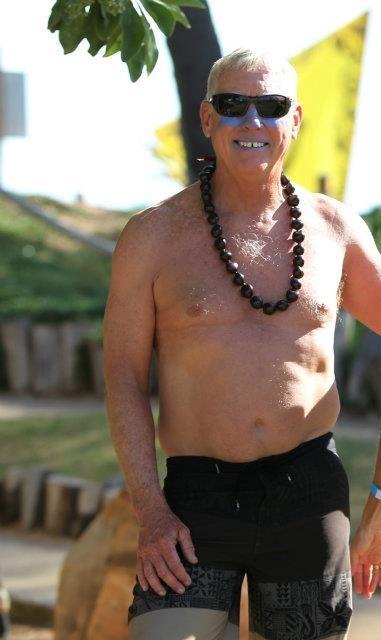 One was Ed’s second rotator cuff surgery (yes, he was brave enough to go through that torture twice) and our trip to Maui to try the short version of the Ho’olaule’a event. Four days after the coolest downwind adventure either of us had experiences poor Ed went under the knife. But not before we were hooked on downwind, open ocean fun! In the pictures above, it’s easy to see we are still the happy ocean-loving “kids” we were back in 1967 but it’s also easy to see that our abs are a bit worse for wear at age 63. Fortunately, just before the start of our event, Maui local and globally respected standup paddler/athlete, Suzie Cooney, provided a pre-race warmup. 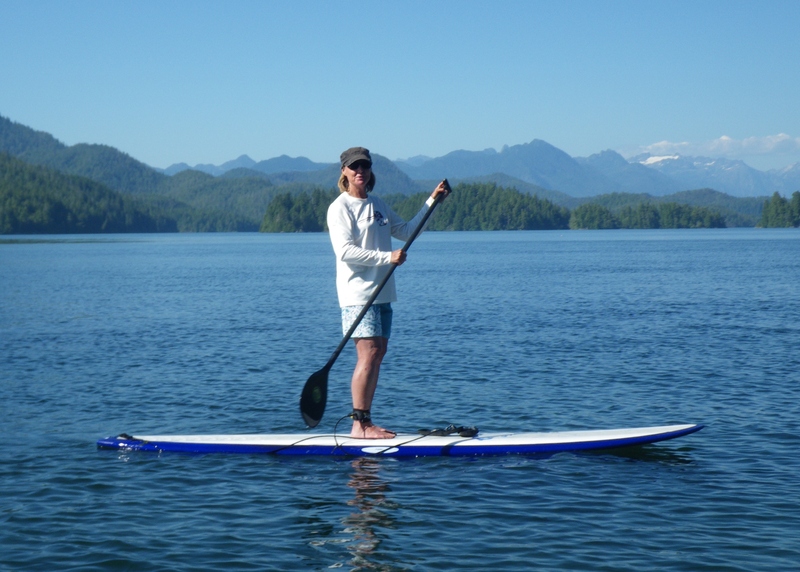 That gave us a chance not only to meet Suzie but to get to know a bit about her dedication to training a diverse group of clients from the casual paddler to elite athletes. As Ed went from wearing a sling to hefting the 3 lb weights he’s now using in PT we both made a commitment to getting into our best functional fitness over the next 8 months. As much as we already know about exercise and nutrition, we realize that insights, motivation and programming provided by a respected professional is mandatory, especially as we embrace our seventh decade. Over the summer, Suzie Cooney has been kind enough to listen to our plan to follow her training “at a distance.” Nothing can replace actual time at her training facility with her customized training delivered face to face. Just the same, we have made a decision to glean as much as we can from her blog and conversations. We have a solid goal in mind. We plan to be at the start line on May 11, 2013 ready to enjoy the full Olukai Ho’olaule’a downwind run from Maliko Gulch to Kanaha. “Pie in the sky” – This Saturday I plan to join other hopefuls as I buy a couple of lotto tickets – would be cool to win $5000 or so. We’d probably jet off to Maui in November and prepare for Maliko at Suzie’s upcoming clinic. Meanwhile, training in Oregon is underway. The “training table” is becoming ever more healthful and an Indo Board is on its way to our home. The digital age could very well allow us the best connection with our partner in preparation, Suzie Cooney. Most watched film this week – this training session from the Suzie Trains Maui blog. YES! We want endurance, core strength and balance. This is an excellent overview of some training options. Bring it, Suzie! Perhaps every sport has its heroes, good karma ambassadors and experts eager to share their time, skills and experience with newbies – but SUP seems to have more than its fair share. As with most categories of leaders in most any field, the busiest seem to be the most eager to share. 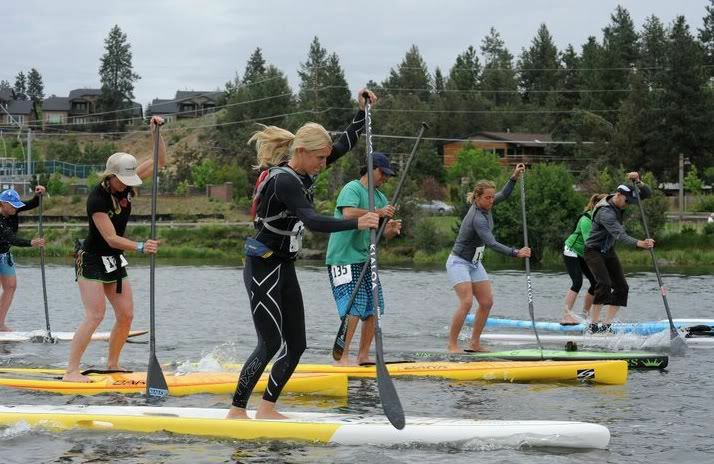 Chuck Patterson and Karen Wrenn gave clinics at the 2011 Bend Paddleboard Challenge. Before and after their clinic they shared freely with any paddlers hammering the questions their way – and always with a smile! Karen is a busy mom and competitor, but like Chuck she’s and incredible ambassador for our sport. Most recently I have had the good fortune to know one of the younger leaders in standup paddling, surfing, and all types of racing, Brit Oliphant. We share the same home town, and often cross paths on the Deschutes River that flows through town. As Brit offers training to all ages in groups large and small the constant is enthusiasm and a great smile. Day after day! Just out of high school, Brit has a love of life and maturity that’s rare at any age. While disciplined training has provided the fitness background needed to compete at the highest levels, an absolute love of oceans and rivers adds a special something else. So, as I wavered in my commitment to watch-participate-watch, maybe, or participate (should I?) in the upcoming 2012 Naish Columbia Gorge Paddle Challenge I went out for an easy paddle with a friend yesterday. “Hey, Judy!” I heard as I walked past the Sun Country SUP rentals at our RiverBend Park. It was Brit, back from a one day training trip to Hood River where she and fellow paddlers had done a few rounds of the 8 mile downwind course. In chatting, she heard me mention that I was still wavering about doing the event and might just rent the Naish race board my friend Steve Gates recommended in case I decided to do the downwind on Sunday. Now, I know that Brit recently got a brand new Joe Bark designed Candice Appleby Model 12’6″ race board. She’d paddled it to a win at the recent Gerry Lopez Elk Lake WPA race and was obviously thrilled. That said, without a moment’s hesitation Brit said, ‘Judy, if we aren’t racing at the same time you can use my board on Sunday.” Sharing a brand new anything is generous – but a race board – what a cool gesture, Brit. Generosity like that is rare. I won’t be borrowing her cool race board, yet the offer was easily sincere. The confidence I gained from Brit’s wholehearted advice, hints and belief that not only could I do the event but I would have a world of fun (if the wind cooperated) at the same time. Let’s see what Sunday brings. My guess is that we will see Brit competing toward the front of the elite class, smile shining, having a blast whatever place comes her way. For me, I hope I muster the nerve to give it a go. Better register now! Warm up before the race. Practice steadily whenever you can and get used to how “enough” feels. Use a heart rate monitor now and then – so you learn what “enough” for you REALLY feels like.. The day before the race, work out a little and then rest up well. Stretch after you paddle for practice and get used to what “nicely warmed up” feels like. Honor your current ability and fitness. In the recent “fun paddle” part of the Olukai Ho’olaule’a, Suzie Cooney lead a group stretch and warmup before our 3 mile paddle. It got us ready physically and relaxed mentally. Be chilled out and friendly. Smile, joke and chat with others before the start, noticing who really needs to simply be left alone. There is bound to be a jittery someone you can calm a bit with a few words and a smile. Keep a steady start. If you get a shaky one you won’t get a good position. Wait a minute here! If you are reading this article, chances are you will not be gracing the podium and accepting an award (unless you win the raffle prize). Yes, keep a steady start but keep a stead attitude too. Watch confident paddlers at or about your skill level and stay a bit behind them. They will help you learn to judge the local current, winds and start situation. Do you see the paddler to the far (far far far) left of the photo, the one in the cool blue KIALOA hat? That is me getting confidence and timing from some of the best. YES, that is as close as I got to Karen Wrenn at the 2011 Bend Paddleboard Challenge – except when she lapped me! Stay humble. Each person you pass delivers a chance to share a smile and “Go for it!” – if you have the breath (LOL). But keep your self confidence saying ” I can do it”. In a long distance race keep your hands loose around the paddle shaft. Wiggle your fingers now and then and use a loose grip and focused, strong paddle stroke. Remind yourself of your technique when you feel fatigued, it will bring you back into your best rhythm. Use your sense of touch. If you get tired during a long distance race or even a sprint, take a moment to breathe and feel. Feel the water on your feet (are you barefoot?) Feel the wind on your face – even if it is blowing stink and making it hard to paddle. Savor the opportunity to be moving yourself through the natural and sometimes wild outdoors. Use your hearing. Hear the steady lap-lap-lap of the water on and under your paddleboard. Hear your own breathing and monitor it. Hear your own voice humming or singing a tune to keep you in your aerobic zone – that matters in the longer races. Use your sense of sight. After all, our “race courses are usually staged in oceans, bays, lakes and rivers in places most people would love to be. Got polarized sunglasses? See the bottom, see the colors, the rocks and the vegetation along the shore. Smile! Your body will love you for the expenditure of energy you allot to a great big grin. 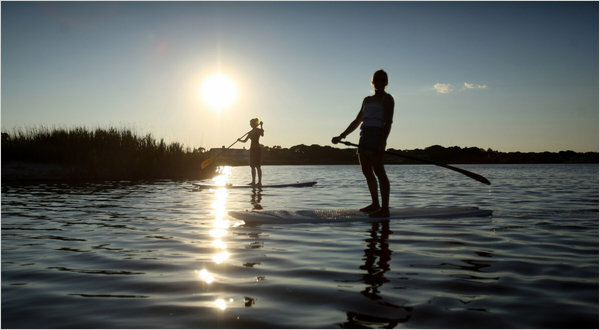 Fun and relaxation will join the smile – after all, how many people get to experience the amazing sport of SUP racing. By the way, if you follow these 10 easy steps you WILL be a winner in any SUP race you choose to enter.